Drew Totten Autographs Item: 0000284147 -- Munsters' Very Rare Signed Photo By Gwynne, DeCarlo & Patrick - Wow! Munsters' Very Rare Signed Photo By Gwynne, DeCarlo & Patrick - Wow! AN INCREDIBLE SIGNED PIECE FROM ONE OF TELEVISION'S FUNNIEST SHOWS! 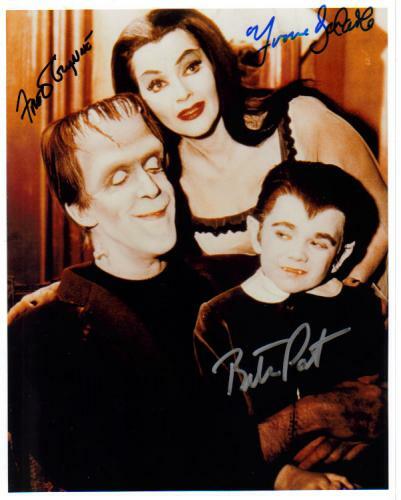 THIS IS A GREAT 8X10 SIGNED PHOTO OF THE MUNSTER FAMILY AUTOGRAPHED BY FRED GWYNNE, YVONNE DE CARLO AND BUTCH PATRICK! A RARE (AND UNCOMMON) COMBINATION... ALL ON ONE SIGNED PIECE!